R.A. Dickey's next challenge will be against the Yankees on Sunday Night Baseball.Two years ago, R.A. Dickey was cut from the New York Mets during spring training and sent to the minors. Two days ago, Dickey etched his name in the major-league record books by becoming the first pitcher in modern baseball history (since 1900) to throw back-to-back complete game one-hitters with at least 10 strikeouts in each start. He also is the first pitcher since Dave Stieb in 1988 with back-to-back one-hitters and the first National League pitcher to do that since Jim Tobin in 1944. In an interesting twist, Tobin learned the knuckleball in 1944, the same year he threw back-to-back one-hitters (one of which was a no-hitter). That outing against the Baltimore Orioles on Wednesday capped an unprecedented five-start stretch during which Dickey went 5-0, allowing a single unearned run over 41⅔ innings, with a ridiculous 52-to-5 strikeout-to-walk ratio. According to the Elias Sports Bureau, Dickey is the first pitcher with zero earned runs and at least eight strikeouts in five straight starts since earned runs became official in the NL in 1912 and in the AL in 1913. If you go back further, Dickey has won his last six starts, with 63 strikeouts and only two runs allowed over that span. No other major-league pitcher since 1900 went 6-0 with at least 60 strikeouts and two-or-fewer runs allowed over a span of six straight starts. Dickey hasn’t just been dominant the past month; his entire season so far is near-historical. He is just the fifth pitcher in major-league history with at least 11 wins and an ERA under 2.50 while averaging at least a strikeout per inning in his first 14 starts of the season. With several entries in the all-time major-league history annals already this week, what is left for Dickey to accomplish in his next start against the New York Yankees on Sunday Night Baseball (8 ET, ESPN)? Dickey has had five straight starts of at least seven innings and zero earned runs. Only three pitchers in MLB history have had six-or-more consecutive starts like that: Orel Hershiser (6 in 1988), Don Drysdale (6 in 1968) and Jim Bagby (8 in 1917). 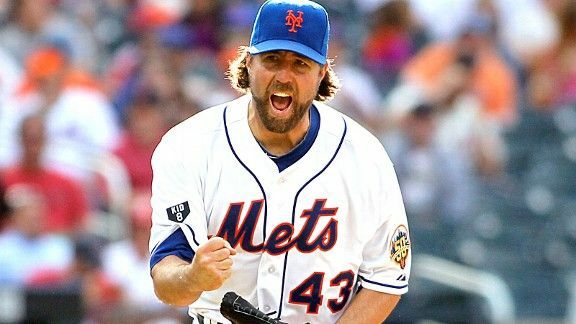 Dickey hasn’t allowed an earned run in his last 42⅔ innings, which is the second-longest such streak in Mets history. The franchise record for consecutive innings without allowing an earned run is 49 by Dwight Gooden in 1985. He also has seven straight starts with at least eight strikeouts and just two walks, matching the modern record done three times previously by Sandy Koufax (1965), Curt Schilling (1997) and Randy Johnson (2001), according to Elias. He will try to extend each of these streaks in the finale of the Subway Series on Sunday night at Citi Field. Dickey has pitched well against the Yankees since joining the Mets, allowing two runs over 11 innings in two starts (both last season). His 1.64 ERA is the second-best against the Yankees since the start of last season of any pitcher that has started at least two games versus them.